Since 20 June 1981, when the all-out repression started in Iran, it is estimated that 0.5 million people have been imprisoned in Iran for their political beliefs. The number is on the increase. Please click “Donate Now” and help us to raise awareness internationally and campaign to release the political prisoners in Iran. Following the 1979 Islamic revolution in Iran, the theocratic regime embarked on a campaign to eliminate all voices of dissent. Since 20 June 1981, an all-out repression started. It is estimated that 0.5 million people have been imprisoned in Iran for their political beliefs. They are under severe torture to put aside their beliefs. The number is on increase. Recently, 2 witnesses managed to leave Iran. The following are their testimonies on the situation of Political Prisoners in Iran. He escaped from Iran in summer of 2015. Farzad was imprisoned in Iran for 5 years. Blindfolded with his hands in cuffs, Farzad Madadzadeh would be beaten for up to 16 hours a day in an Iranian prison. He escaped from Iran in summer of 2015. Farzad was imprisoned in Iran for 5 years. Blindfolded with his hands in cuffs, Farzad Madadzadeh would be beaten for up to 16 hours a day in an Iranian prison. He was given electric shocks and punched by three guards who threw him around like a ‘football’, before returning him to a 1.5m by 2m solitary confinement cell. Each night for five years he would fall asleep wondering if death would come for him in the morning, or whether yet another day of torture and questioning was in store. His only crime? Speaking out against misconduct by Iran’s regime. Farzad: “Greetings to the struggling prisoners, and greetings to the martyrs of freedom. My name is Farzad Madadzadeh. I have recently come from Iran. I am 30 years old and I have spent 5 years in the regime’s prisons. The suffering of people concerned me and fighting this criminal regime and ending this suffering became my goal. I was arrested in 2008 and condemned to 5 years in Evin and Gohardasht Prisons. When I was arrested, they took me directly to the dreaded 209 ward and locked me up in solitary confinement twice for a total of 6 months. The solitary confinement is a place where you hear nothing but the gong of death and the regime uses it to break the will of prisoners. Just in this condition, the henchman demands that you appear on TV and to tell lies about your beliefs. The greatest lesson that I learnt in the solitary confinement was that you have to fight every second of it and this is the secret to the victory of the prisoner. After the hard time I spent incommunicado, they removed me from Ward 209. I was first transferred to general ward in Evin and then to Gohardasht Prison in the city of Karaj. In Evin and Gohardasht I was in the same cell as heroic martyrs Ali Saremi, Farzad Kamangar, Farhad Vakili, Jafar Kazemi, Mohammed Ali haj Aghaii, Mansour Radpour, Mohsen Dogmechi and Sharokh Zamani. Their memories are with me all the time. When Jafar Kazemi heard about his death penalty, he said that the struggle and the tree of Liberty need blood and so much better that it would be my blood. Farhad Vakili, the son of the Kurdish people, always used to say to me: ”Farzad! Let them hang me so that the children of this land and specially my small children have a happy future and never experience torture and execution. And Ali Saremi whom I found humanity and love in him, used to say that he fights the regime with his pen so that the world would learn about the ongoing tyranny against our people. When I was in Gohardasht prison, I reminded Ail (Saremi) that when out of the prison you always had the pictures of Sister Maryam and brother Massoud with you. He always hid the pictures in his wallet and when he saw someone he would give him the pictures. I asked him: what do you do here without the pictures? He gave me a copybook that was on his bed and when I opened it I found the pictures of sister Maryam and brother Massoud inside. He had cut out the pictures from newspapers in prison and kept them. With his familiar smile he said: My boy, I Don’t go anywhere without the pictures of my leaders. Yes, their crime was that they had a big heart and a lot of love. One day, we shall again find our doves (martyrs) and kindness will take the hands of beauty. The day that the least hymn is a kiss. And every man is the brother of the other. I await that day even if I am not there when that day comes. Allow me to tell you of youngsters that are arrested for whatever charge at ages of 13 or 14 and then, in a gradual death they await their execution to come when they reach the legal age. Their birthday is their most ominous day since with every birthday they get one step closer to their deaths. And during these years of waiting do you know what the regime does with them? It makes them drug addicts! Don’t be surprised! The one thing that you can easily find in Iran’s prisons is narcotics because the regime’s elements bring drugs to the prisons to make addicts out of the youths and particularly the political prisoners. However, outside the prison, they arrest and hang people for carrying 30 grams of narcotics under the pretext of combating drugs. The day I was freed from Gohardasht prison when I was bidding farewell to my cellmates I pledged to be their voice who have been wronged, as well as the voice of the Iranian people. What the suffering people of Iran and the political prisoners are saying to the international community is this: it is scarcely enough to just condemn this regime in words. Bring the mullahs to the international courts for their crimes especially the massacre of 30,000 political prisoners and their daily and incessant executions. Paria also escaped from Iran in summer of 2015. 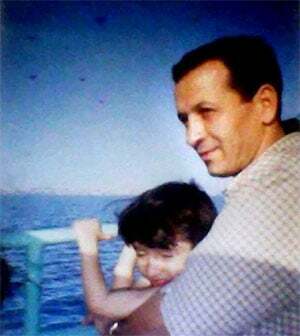 A female activist born in Tehran, her father is renowned political prisoner, Saleh Kohandel, who was first jailed when she was just four years old. He is currently serving a 10-year sentence at Gohardasht Prison for opposing the regime and she visited him during his incarceration. Greetings to all you dear friends and all my compatriots that hear my voice. My name is Paria Kohandel. My father is political prisoner Saleh Kohandel who is imprisoned in the dreaded Gohardasht Prison. I bring you many greetings and hails. The greetings of thousands of political prisoners in Iran’s prisons; the cries of mothers whose tears rain down on the floors of prisons; the greetings of the working children with calloused hands who are waiting to breathe the clean air; the air of liberty and emancipation; The greetings of those who kiss the noose in Gohardasht, Evin and Kahrizak Prisons. My greetings have passed through the barbed wires of Gohardasht, the thick walls of Evin, and the storehouses of Qarchak; The prisons where during my childhood I used to run in their dusty visitors’ halls. I am the weekly voyager to Gohardasht and Evin prisons. As my father says, the Pari with a wonderful voice whose father lived only 20 minutes a week. Twenty minutes from behind the dusty glasses and my only hope was to see the shine in the eyes of my father when he talked about liberty. He was so energetic and I couldn’t figure out where he brought all that energy from. I go back to March 4, 2007 when I was an 8 year old restless girl. I was deep in my thoughts and was calmly weeping. My father embraced me and kept talking to me until I fell asleep. The morning of that day, elements of the intelligence ministry broke into our house, broke our windows, put a gun to my head and took my father with them. My father was in prison for 1.5 years before that as well and this time, because he said no to their demand that he speak against the PMOI in an interview, he was condemned to 10 years in prison in exile and was sent to the dreaded Gohardasht prison. The whole story was about these 10 years that led me to choose this path in my life. A few months ago, exactly 20 days before the entrance test for universities, I left Iran. I said to myself that Paria you now can have anything that you ever wanted that was forbidden in Iran. All your dreams and your colourful wishes; to ride a motorcycle, that was my biggest dream, to exercise Parkour and gymnastics, and to study my favourite field which is physics. However, what I had left behind in Iran would not let go of me. I found myself in a dilemma; should I follow my dreams or should I choose the path of resistance to bring about the dreams of all the children that are captive in Iran, such as the dreams of my dear friend and other girls like her? In the last moments of making that decision, I remembered my last meeting with my father. As I was going to visit him, a 9 year old boy came along. He passed through the dark and horrendous 1 km tunnel of Gohardasht with me. He was carrying a drawing in his hand. When I looked at it, I wanted to cry. He had drawn a picture of himself and his father hand in hand. I remembered my childhood when I was in his shoes. I was really moved. I told my father: Today, as I was coming to see you I passed through the memories of my childhood. That boy had a message for me which said: Paria, look! You are not the sole traveller of these tunnels. Before you, hundreds of children have travelled these tunnels and after you hundreds of other children are condemned to pass this path as long as this regime rules your homeland. And the other moments that I had in making my decision: I remembered Uncle Ali, I am talking about Ali Saremi, the best uncle in the whole world; his last glance at me. Resting his head against the skewed bars of the visitors’ cabin, he smiled as he saw me, a lovely smile that was full of energy. It had a message for me. A few weeks later, I heard that he had been executed. My best uncle was gone. It was as if I had to get used to see people that I love leave me; like Uncle Abdolreza Rajabi that was martyred under torture. Or the sad moments that I again experienced, when Uncle Mohsen Dogmechi was martyred. These moments made me restless. I saw my solid and powerful Uncle Mohsen who had become sick and feeble because he was deprived of medical care, but his love still penetrated the depth of my soul and his power still shook the guards. All of them had a message for me in the last minutes of their lives. At that moment, I came to understand that I have to be their voice, to testify to their struggle, to be the interpretation of the glance of Uncles Mohsen and ALi. This would be my responsibility and my great dream. I understood that I cannot just think about my own dreams. My colourful dreams are just a small part of my life. I owe it to my family, to the prisoners, to my martyred uncles, and ultimately to my struggling father; because I am free now. When the Iranian girls have so many dreams that look so far away, to pursue my own dreams would be selfish. And that was how I forwent my small interests, just like thousands of Ashrafis. My big dream is to see the happiness of children so that they never have to pass the tunnel of Gohardasht. To make true the dream of girl petty sellers and of the small boys that sell omens in our neighbourhood. Here today, in front of everyone, I pledge to travel the path of my martyred aunt and uncle and to bring about the world of love to everyone, without any expectations for myself. I can hear the echo of my father’s call who said: Paria! I have drunk the pure wine that you have not even smelled! From here, I say to all those resisting prisoners that I used to see every week from behind the cabin windows that I have learned from all of you that perseverance and resistance is something that no one can take away from you. This is the path I have chosen to enter. Narges Mohammedi: Lawyer, Imprisoned because of defending political prisoners. She was returned from the hospital to the prison while she was still in critical condition. Atena Faraghdani: Imprisoned because of drawing cartoons criticizing the government. Please do not leave us alone. There are many more to be set free. Please click “Donate Now” to enable us to be their voice and help to release their loved ones from the mullahs’ prisons.